As I'm getting older I found myself interested in cream product more. I have dry skin and powder just don't sit on my face nicely and I really don't like the powdery look. 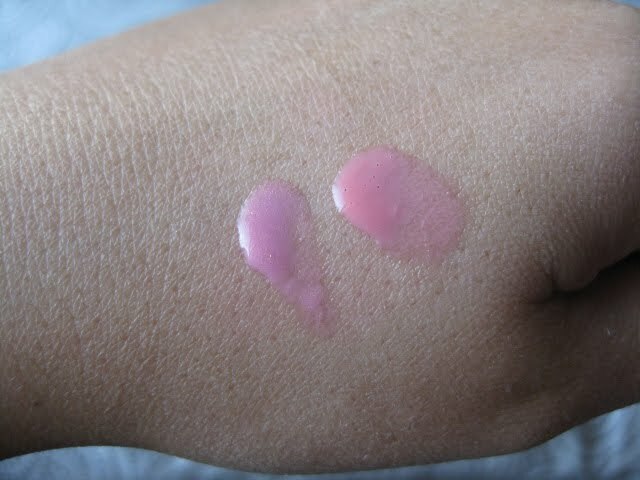 I ventured out to try more cream blushes awhile ago and found a few products that I'm pretty impressed about. They give me this dewy and more youthful look that I'm looking for. 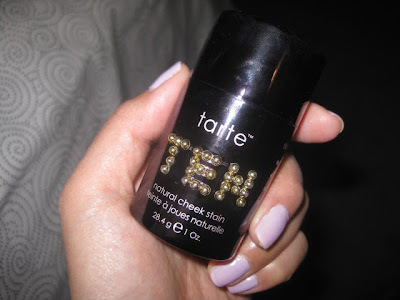 "This best seller is all new in a limited-edition sleek, gold-studded tube in Tarte's signature dark purple and limited-edition shimmering bright pink shade to invigorate all complexions. 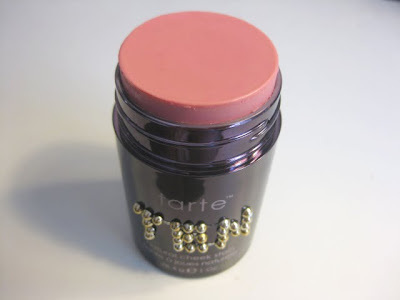 Powered by the T5 Super Fruit Complex™, this nutrient-rich natural cheek stain fights free radical damage while treating skin with antioxidants, vitamins, and minerals." And they claim that the product formulated without Parabens, Sulfates, Synthetic Fragrances, Synthetic Dyes, Petrochemicals, Phthalates. 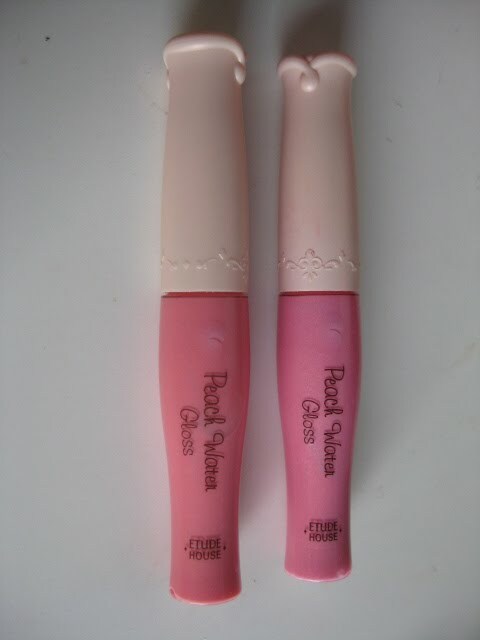 It looks like a soft baby pink and goes on to the skin very sheer, I don't have to worry about over doing it. 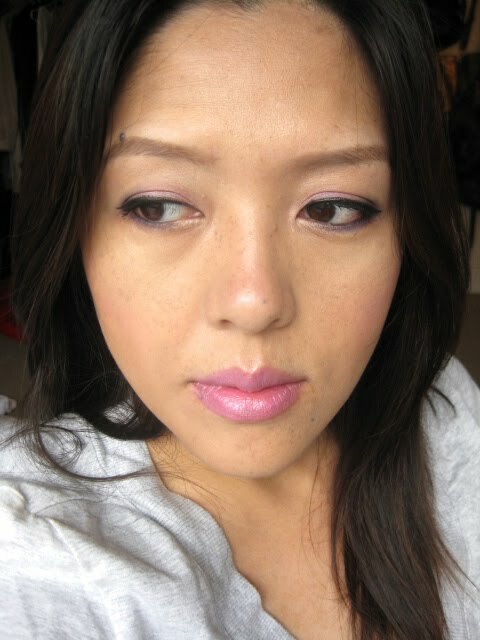 It's not sticky, easy to blend and I can build up the color easily. 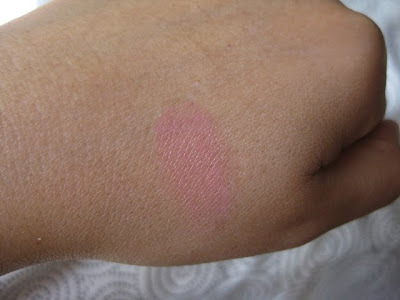 I just use my finger gently tap it on to my cheeks so it won't mess up the already applied foundation and concealer. I do like that it is easy to use and how dewy it makes my skin looks, but I found that as it goes on to my cheeks, it turns warmer and more peachy color than how it looks in the container, the neutral baby pink. Over all I do recommend the product coz the application and how natural looking it is, just wish that the color doesn't turn warmer when it's on the skin. 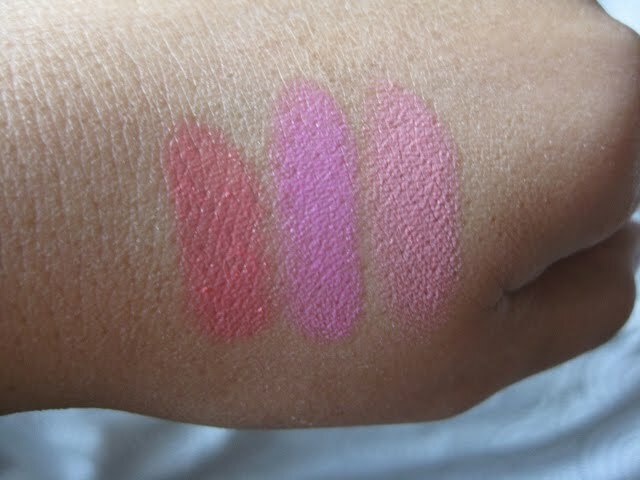 I will be checking out more colors on their regular line since I do like the quality of the product. Do you like creamy blushes? Anything worth trying? 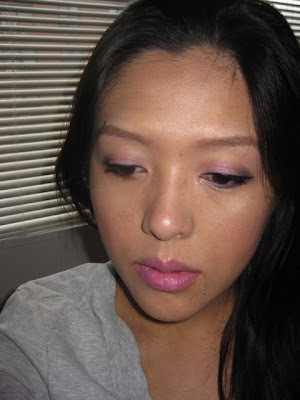 I was never a big fan of Stila and only own couple of their shadows before. Even tho I really like the concept of lip and cheeks convertible colors, I've never found a color I really love. I saw couple peoples reviews about these travel palettes and I was totally attracted by the convertible color(Sakura) in this pallet and decided to track it down. 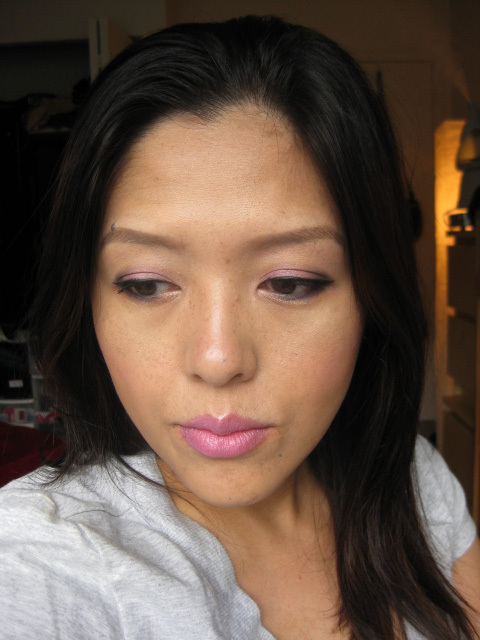 It's such a neutral baby pink that is not too cool or warm, I can see it works so well on my cheeks and lips. Since I have no access to Ulta and I did not want to pay expensive shipping for this pallet on Stila.com, I pick this up at Urban Outfitter for $10, such a great buy for a Stila palette. 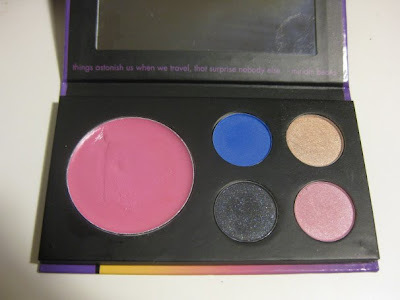 It contains 4 eyeshadows and 1 convertible color. I'd used it for a few times ever since I got it. What do I think? We all know that Stila's shadows are famous for their soft, buttery texture and vibrant color, but for these shadows, they are really not that great. 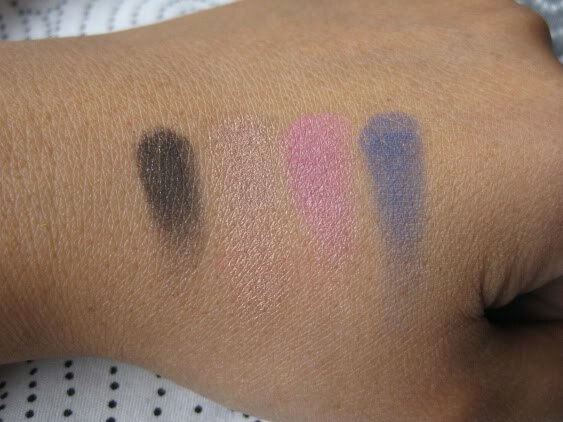 They're like drugstore eyeshadows I have to say... they're not as pigmented as their regular line, and feel kinda chalky. 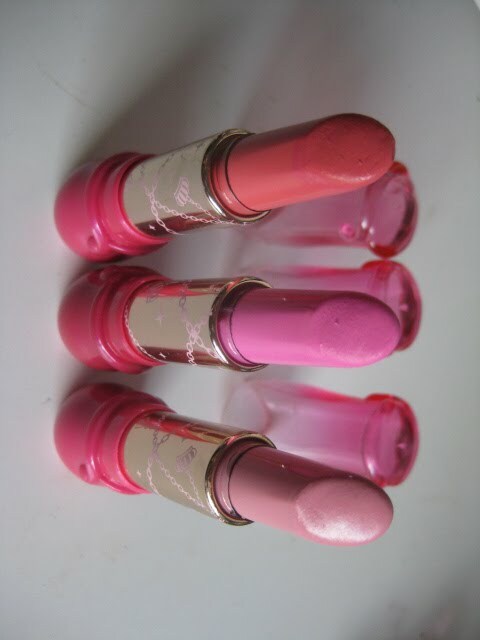 My favorite color will be Sake, the light beige one, it has gold sheen and actually looks pretty when I pile it on. 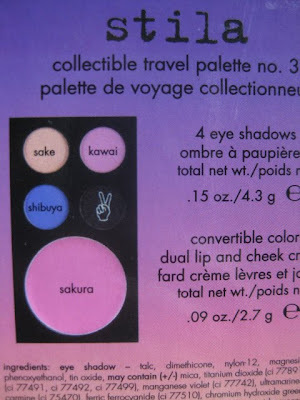 The convertible color Sakura..... was a totally different story. I'm in LOVE with this color. 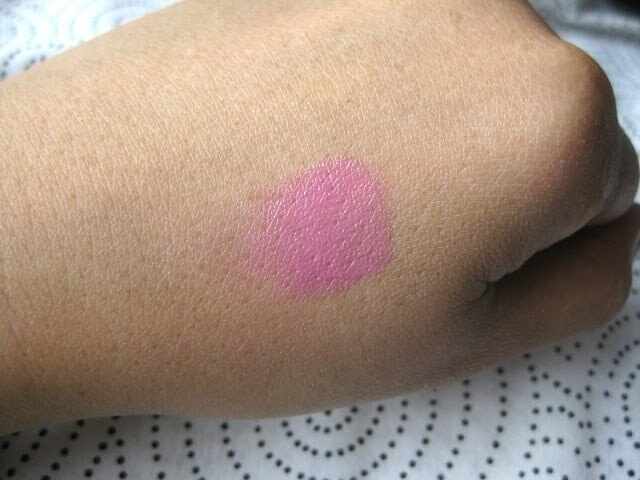 It's such a lovely color which doesn't turn red on my cheek(most baby pink blushes do). The texture is so creamy and easy to blend, and I really really like it on my lips (more than cheeks)! Here is me with the whole palette on my face. Kawai on the lid, Sake under brown bones and inner corner, the black color (no name) on my outer corner and Shibuya on lower lash line. 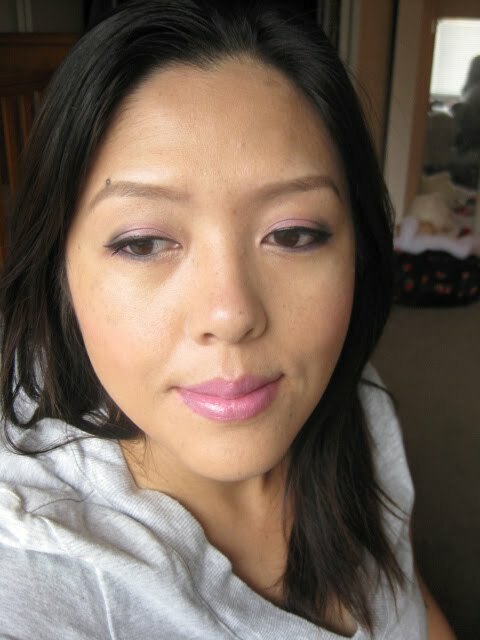 Sakura convertible color on my cheeks and lips.